A variety of parasites attack human beings, including those that infect your gastro-intestinal system. Tapeworms and hookworms are examples of these types of parasites. Parasites enter your system through your mouth by eating contaminated, unwashed and uncooked food items as well as by drinking contaminated water. Additionally, contamination occurs if you pick up parasite larvae on your hands from contaminated surfaces. Certain foods exist that tend to control and even kill parasites. Garlic has a demonstrated effectiveness at controlling and killing parasites. 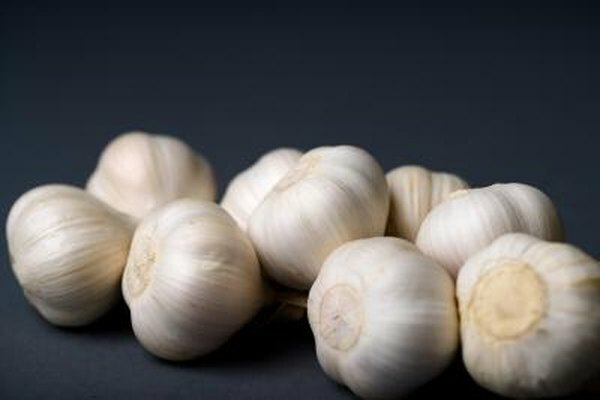 Consuming garlic alone rather than as an ingredient in a prepared dish is the most effective means of using it to kill parasites. Garlic, with its antioxidant properties, also is effective in protecting you against oxidation that toxins from parasites cause. Cranberries, particularly raw cranberry juice, assist in killing parasites. Cranberries increase the acidic level in your intestines, which works to control and eliminate parasites. Keep in mind that raw cranberry juice is extremely tart. You do not want to add sugar to cut the taste because that diminishes the effectiveness; parasites thrive in the presence of sugar. Apple cider vinegar is used as a substitute for raw cranberry juice for the same purpose. Eating pumpkin seeds is reported effective against parasites, particularly tapeworms. Ground pumpkin seeds are combined with honey and milk in Germany as a natural remedy for parasites. Combine between 200 to 400 grams of ground pumpkin seeds with honey and milk to make a mash, according to Publix Wellness & Pharmacy. A variety of herbs assist in killing parasites in your gastrointestinal system, according to Publix Wellness & Pharmacy. These include goldenseal, goldthreat, Oregon grape and barberry. These herbs contain a substance that is known as berberine, an element that has been proven to control and kill parasites.